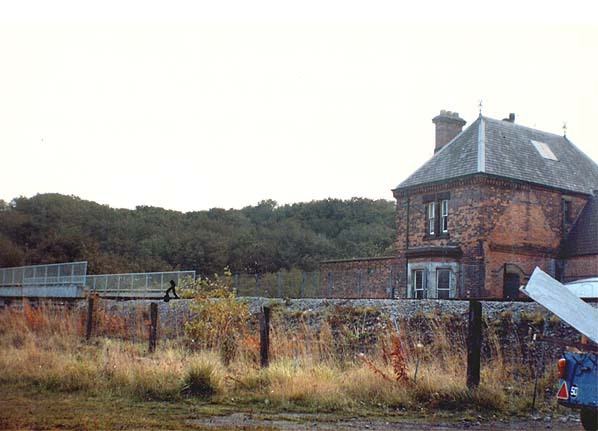 The stationmaster's house survives as a private residence but the remainder of the station buildings which were attached to it have been demolished. The large brick goods shed on the 'up' side of the line is also still extant. Notes: Lofthouse Station opened for goods traffic on 27th May 1867, it was renamed Loftus on 1st November 1874. The station opened to passenger traffic on 1st April 1875 as the terminus of the line from Saltburn becoming a through station when the Loftus – Whitby line was opened on 3rd December 1883. 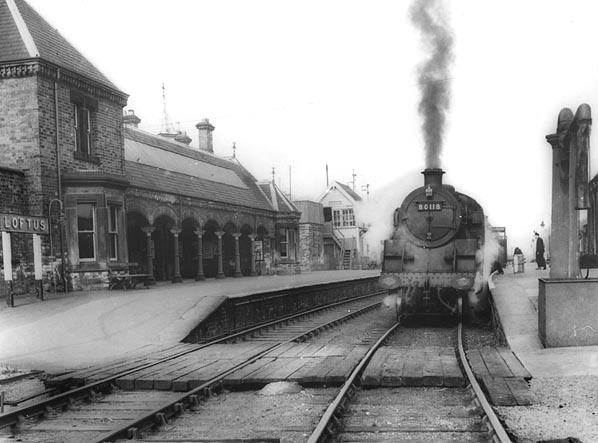 The station was closed to passengers on 2nd May 1960 but remained open for goods traffic until 12th August 1963. The station had two platforms with a large range of brick buildings incorporating the stationmaster’s house and the signal box on the ‘down’ side and a smaller brick waiting room and toilet on the up side. The goods yard was on the down side of the line behind the station and comprised three sidings with a substantial brick goods shed. The line through the station was re-laid from Skinningrove to serve Boulby Potash Mine; this opened on 1st April 1974. At this time the platforms were demolished along with the majority of the station buildings leaving only the stationmaster’s house and the goods shed. In order for trains to reach the mines and gasworks below the village of Carlin How a zig zag was built; a formation most unusual for a British railway. The branch started north of Skinningrove station and ran for about ¾ mile at about 1 in 37 down into the valley before ending in a reversing neck below Kilton Viaduct. The second leg was much steeper at 1in 28ending in another reversing neck from which trains could proceed along the valley floor to the various sidings. 1st November 1878 and ran via Boosbeck station which was opened on the same day. Many of these trains ran to Saltburn via Brotton necessitating three reversals; at Hutton Junction, Guisborough, at Brotton and at Saltburn West Junction. Some services reached Saltburn directly by the Priestcroft curve although regular passenger workings using the curve had ceased by 1918. The Guisborough – Brotton – Saltburn – Loftus services were obvious candidates for NER push-pull operation; LNER Steam Railcars and later the BR DMUs were used to advantage here. 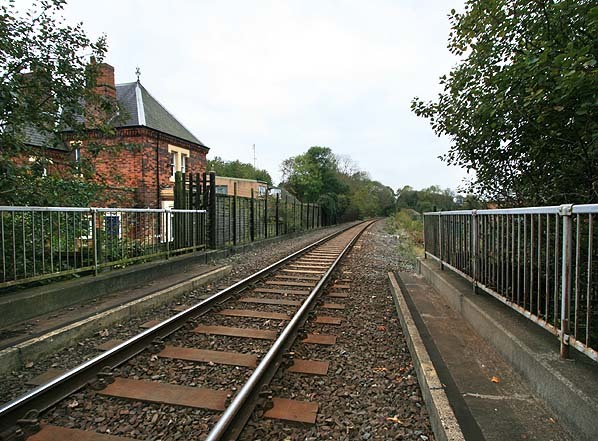 On 1st July 1902 North Skelton station was opened and remained in use until 1951.On 6th September 1957 the Saltburn West Junction to Brotton line was closed to passengers but remains open for freight to this day. Following the demise of the Loftus – Whitby service in 1958, Loftus again became a terminus with passenger trains running to Middlesbrough via Guisborough until 30th April 1960. Goods facilities here came to an end on 10th August 1963. The line was singled and reopened beyond Skinningrove to Boulby on 1st April 1974. It remains open and carries mineral traffic from Boulby Mine and steel from Skinningrove. Railways came to Whitby early with the opening of the Whitby – Grosmont Railway on 15th May 1835. The line was extended to Pickering as a horse worked line on 26th May 1836 and on 7th July 1845 the Whitby – Pickering Railway was extended to Malton. On 16th July 1866 the Whitby, Redcar and Middlesbrough Union Railway was incorporated with the intention of linking Whitby to Lofthouse (Loftus) with a line along the coast. The line was intended to branch off the Whitby - Grosmont line 93 yards short of Ruswarp station. Another short branch was planned here to join the proposed Whitby to Scarborough Railway at Larpool Wood. Because of a lack of finance it took until 3rd May 1871 for the contract to build the Whitby, Redcar and Middlesbrough Union Railway to be signed. The contractor was John Dickson. Construction of the new railway started on 25th May 1871 when the first sod was cut near Sandsend by the Dowager Marchioness of Normanby. The new contractor found the previous work to be unsatisfactory and in the short period whilst work was suspended part of the cliff route north of Sandsend had collapsed into the sea. The new contractors drove the railway through the headlands rather than go round them. Two tunnels were constructed, Sandsend tunnel (1652 yards) and Kettleness tunnel (308 yards); between them a short stretch of the original course along the cliff edge remains. Five steel tubular viaducts were erected on the line at Upgang (330 ft long, 70 ft high with 6 spans), Newholm Bank (330, 50, 11), East Row (528, 30, 8), Sandsend (268, 63, 8) and Staithes (790, 152, 17). Staithes viaduct was protected by a wind gauge which rang a bell in the signal box when the wind pressure reached 28 lb/sq. ft. At this point traffic over the viaduct was suspended and could only be resumed after the structure had been inspected. The Whitby – Loftus line was ready for use on 3rd December 1883, 2 1/2 years behind schedule and the first train left Whitby station. 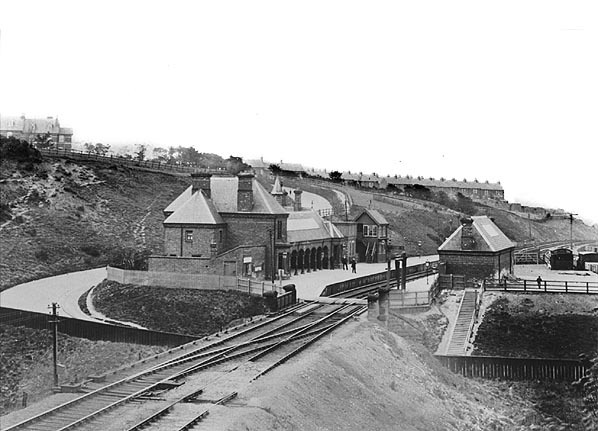 The new line served stations at Whitby Town, Whitby West Cliff, Sandsend, Kettleness, Hinderwell, Staithes, Easington (renamed Grinkle in April1904) and Loftus. The line formed an end on junction with the route of the former Cleveland Railway at Loftus so allowing trains to run through from Whitby to Saltburn using the former Cleveland Railway route and the later NER connection between Brotton and Saltburn. On 16th July 1885 the Scarborough and Whitby railway opened and joined onto the WRMUR at Prospect Hill Junction so allowing direct trains to run between Scarborough and Saltburn. The line exploited the camping coach business with coaches being provided at Sandsend (2), Kettleness (2) and East Row (3) between 1933 and 1939. The business was suspended during the war and opened again in 1952. On 3rd May 1958 the line was closed completely between Whitby (West Cliff) and Loftus and Loftus reverted to becoming a terminus for trains from Teesside until its closure for passengers on 30th May 1960 and goods on 10th August 1963. Whitby (West Cliff) remained open for trains ex Scarborough until 10th June 1961. 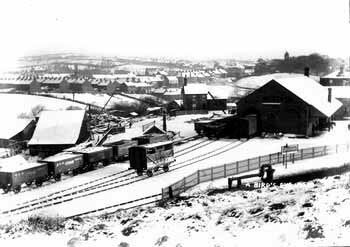 From this date Scarborough – Whitby trains reversed at Prospect Hill Junction for Whitby Town station. The site of Loftus Station looking west in October 2007; only the stationmaster's house survives.